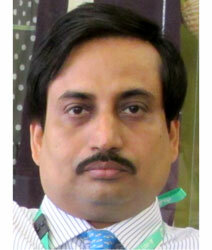 Dr. Asish K. Mukhopadhyay is working as at National Institute of Cholera and enteric Diseases, Kolkata since March 2003. After finishing the Masters from University of Calcutta, he started research under Dr. G. Balakrish Nair at the division of Microbiology on the epidemiology, evolution and virulence of Vibrio cholerae, for his doctoral thesis. His thesis research focused on population and molecular analyses of Vibrio cholerae, to gain insights into the interplay between environmental and human disease reservoirs, and genetic factors that make certain lineages of this organism highly virulent to humans. This thesis research contributed to around 25 publications in peer-reviewed journals. After completion the Ph.D., Dr. Mukhopadhyay moved to research with Dr. Douglas E. Berg, Professor of Molecular Microbiology and of Genetics, Washington University School of Medicine at Saint Louis, USA and worked for five years as research associate. He was particularly interested on the genetic diversity, population genetics and genome evolution of Helicobacter pylori and also contributed importantly to our elucidation of mechanisms of susceptibility and resistance to metronidazole, a critical component of combination therapies that are used against Helicobacter pylori. His detailed analysis of virulence-associated genes and house-keeping genes that are under selective pressures showed that Indian H. pylori gene pool is distinct from the Hp gene pools of other parts of the world. His additional studies had contributed importantly to our understanding of the global population dynamics of transposable elements of H. pylori and how they may affect the vigor or virulence of pathogens and Hp genome evolution as well. In addition to the contributions to the Hp field, he performed detailed fundamentally important analysis of CTX prophages and pathogenicity islands in a subset of environmental strains of Vibrio cholerae. Dr. Mukhopadhyay also received training under the Japan International Cooperation Agency (JICA) project for 6 months in 2006 at the Department of Bacteriology, Nagasaki University, Japan with Prof. T. Hirayama on different aspects of vacuolating cytotoxin (VacA) of H. pylori. Under his supervision, four research students are working at present and one has already obtained the doctoral degree and he is the author of 72 research papers on several aspects of V. cholerae and H. pylori. Current research interests of Dr. Mukhopadhyay include diversity, evolution and biology of H. pylori and V. cholerae in the context of molecular pathogenesis, strain evolution and prevention measures. Recently, he has been very successful in adapting Indian H. pylori strains to the murine infection model which will provide further insight into the biological activities of H. pylori virulence proteins and their contributions to bacterial fitness and this holds great promise for functional genomic anlyses of infection and disease processes. Another important pathogen of recent interest is Campylobacter, a significant cause of gastric illness world wide, where the research theme is molecular epidemiology including genomic analysis to provide protected public health. After finishing Masters from University of Calcutta, Dr. Mukhopadhyaystarted research for his doctoral thesis on molecular epidemiology, evolution and virulence of Vibrio cholerae under Dr. GB Nair at NICED. After completing the Ph.D., he moved to research with Dr. Douglas E. Berg, Professor of Molecular Microbiology and of Genetics, Washington University School of Medicine at Saint Louis, USA and worked for five years as research associate on different aspects of Helicobacter pylori. He also worked for 6 months at the Department of Bacteriology, Nagasaki University, Japan with Prof. T. Hirayama on vacuolatingcytotoxin (VacA) of H. pylori during 2006. His analysis on different variant CTX prophages of V. cholerae O139 helped to predict the probable cause of their extinction. His research helped to unravel the genetic makeup of Vibrio cholerae, including hybrid and Haitian strains, which have been implicated in recent outbreaks of devastating proportions around the world. His pioneering research on Helicobacter pylori, causative agent for chronic gastritis and peptic ulcer, first time showed that Indian strains are genetically distinct, which is immensely important from the vaccine development point. His genomic studies helped to understand why metronidazole should be avoided for the treatment of H. pylori in the Indian subcontinent and other studies on curcumin and Elagic acid showed immense therapeutic potential against H. pylori infection, as they were highly effective in eradication of H. pylori from infected mice as well as in restoration of H. pylori-induced gastric damage. Dr. Mukhopadhyay�s laboratory has been exploring innovative ways of understanding the epidemiology of infectious diseases. As a member of an institution with an interdisciplinary research mandate, he has been able to push the borders of his comfort zone and collaborate with clinicians, epidemiologists and other public health researchers to develop a truly multidisciplinary working environment. Current research interests of Dr. Mukhopadhyay include diversity, evolution and biology of H. pylori and V. cholerae in the context of molecular pathogenesis, strain evolution and prevention measures. He has been very successful in adapting Indian H. pylori strains to the murine infection model which will provide further insight into the biological activities of H. pylori virulence proteins and their contributions to bacterial fitness and this holds great promise for functional genomic anlyses of infection and disease processes. Another important pathogen of recent interest is Campylobacter, a significant cause of gastric illness worldwide, where the research theme is molecular epidemiology including genomic analysis to provide protected public health. c) Young Scientist Scholarship for International Congress for Tropical Medicine and Malaria at Nagasaki, Japan (1996). Cholera organisms, vaccines and preparation thereof: Inventors: Thungapathra, M., C. Sharma, N. Gupta, R.K. Ghosh, A.K. Mukhopadhyay, H. Koley, G.B. Nair and A. Ghosh. Patent No.97309957.5-2105, Issued May 1998 by European Patent Office. Changing pattern of the Vibrio cholerae strains in India along with the antimicrobial resistance and its relationship with pathogenesis for better management of cholera (AMED, Japan through Okayama University during 2015-2020). Role of Helicobacter Pylori Tumour Necrosis Factor Alpha inducing protein (Tip Alpha) in causing gastro duodenal diseases including gastric cancer (Funded by ICMR, Govt. of India; during 2017-2020). Exploratory study to standardize PCR tests on paraffin sections to detect Helicobacter pylori and compare with other detection tests. (Funded by ICMR, Govt. of India; during 2017-2020). Elucidation and analysis of Biological Function(s) of Helicobacter pylori Restriction-Modification systems. (Funded by Department of Biotechnology, Govt. of India during 2009 to 2012). Dr. Mukhopadhyay was invited by the Center for Global Safe WASH at the Emory University to attend an International Advisory Board Meeting for the SaniPath-Typhoid study between February 28 and March 2, 2018 at Emory University in Atlanta, Georgia, USA. Dr. Mukhopadhyay was invited at the 52nd US-Japan Joint Panel Conference on Cholera and Other Bacterial Enteric Infections and also to deliver a talk on �Reconnaissance of Indian El Tor vibrios reveal incessant genomic changes" based on his research work during February 20-24, 2018 in Hat Yai, Thailand. Dr. Mukhopadhyay was invited by US - Japan Cooperative Medical Sciences Program on Cholera and the International Vaccine Institute to attend the US -Japan Cooperative Medical Sciences Program�s 19th International Conference on the Emerging Infectious Disease in the Pacific Rim and to deliver a talk on �Pathogenic modulation in El Tor vibrios: evidence from recent Indian strains harbouring Haitian traits� during February 07-10, 2017 in Seoul, South Korea. Dr. Mukhopadhyay was invited to attend the NICED-NIID joint bilateral meeting regarding the HMSC cleared collaborative project on �Laboratory based collaboration network of infectious diseases in Asia� and to the International Seminar on Infectious Diseases at the National Institute of Infectious Diseases (NIID), Tokyo, Japan during January 25th-27th 2016. Dr. Mukhopadhyay presented the progress of hisproject on�Retrospective analysis on the evolutionary aspects of Vibrio cholerae�. Dr. Mukhopadhyay was invited byNational Institute of Allergy and Infectious Diseases (NIAID) of the National Institutes of Health (NIH) to attend the United States-Japan (US-Japan) Cooperative Medical Sciences Program (CMSP) 50th anniversary celebration followed by the 18th International Conference on �Emerging Infectious Diseases (EID) in the Pacific Rim� and also to present his research work at the �Cholera Panel Meeting� under US-Japan CMSP; during January 11-15, 2016 at Bethesda, Maryland, USA. Oral Presentation on �Major Genetic events in the evolution of Vibrio cholerae O1 for the last two decades at Kolkata, India� in the �The International Union of Microbiological Societies (IUMS 2014) - XIVth International Congress of Bacteriology and Applied Microbiology, XIVth International Congress of Mycology and Eukaryotic Microbiology, XVIth International Congress of Virology held in Montreal, Canada during July 27 - August 1, 2014. Presentation of the work entitled �Sequential Genetic Variations of the Vibrio cholerae strains from Kolkata, India and its relation with the Haitian strains� in the �Annual Asia-African Research Forum� organized by the Japan Initiative for Global Research Network on Infectious Diseasesheld in Sendai, Japan during January 20-22, 2014. Attended the NICED-NIID joint bilateral meeting regarding the HMSC cleared collaborative project on �Laboratory based collaboration network of infectious diseases in Asia� and presented the progress of his work in the meeting held in NIID, Tokyo, Japan during September 25-27, 2013. Presentation of the work entitled �Characteristics of Indian Vibrio cholerae strains: Traces of Haitian Variant� in the 5th Congress of European Microbiologists (FEMS) held in Leipzig, Germany during July 21-25, 2013. Presentation of the work entitled �Genetic Attributes of Indian Vibrio cholerae strains: Evidence for the genesisof Haitian variant�.in the �Annual Asia-African Research Forum� organized by the Japan Initiative for Global Research Network on Infectious Diseases held in Tokyo, Japan during January 23-24, 2013. Gehlot V, S. Mahant, A.K. Mukhopadhyay, K. Das, J. Alam, P. Ghosh and R. Das. 2016. Low prevalence of clarithromycin-resistant Helicobacter pylori isolates with A2143G point mutation in the 23S rRNA gene in North India. J Global Antimicrob Resistance. 6: 39-43. Shetty V., M. Ballal, R. Lingadakai, A. K. Mukhopadhyay. 2015. Determination of Helicobacter pylori virulence genes in clinical isolates of symptomatic patients from south coastal region of Karnataka - a preliminary work. Austin J Gastroenterol. 2:1031. Mehrotra, S., R. Jamwal, R. Shyam, D. K. Meena, K. Mishra, R. Patra, R. De, A.K. Mukhopadhyay, A.K. Srivastava, S. Paul Nandi. 2011. Anti-Helicobacter pylori and antioxidant properties of Emblica officinalis pulp extract; a potential source for therapeutic use against gastric ulcer. J Med Plants Res. 5:2577-2583. Nair, G. B., S. Garg, A. K. Mukhopadhyay, T. Shimada and Y. Takeda. 1994. Laboratory diagnosis of Vibrio cholerae O139 Bengal, the new pandemic strain of cholera. LabMedica International. XI: 8-11.68. Mukhopadhyay A. K., Y. Takeda, G. B. Nair. 2014. Cholera Outbreaks in the El Tor Biotype Era and the Impact of the New El Tor Variants. Curr Top MicrobiolImmunol. Vol. 379, p17-48. In G.B. Nair and Y Takeda (eds), Cholera Outbreaks. Springer New York. Ramamurthy T., A. K. Mukhopadhyay, R. K. Nandy and G.B. Nair. 2013. Molecular Typing of Vibrio cholerae: Imprints in the Epidemiology of Cholera. P53-72. In I. de Filippis and M.L. McKee (eds. ), Molecular Typing in bacterial Infections. Humana Press; Springer. New York. Banerjee A., A. K. Mukhopadhyay, S. Paul, A. Bhattacharyya and S. Swarnakar. 2013. "Unveiling the Intricacies of Helicobacter pylori-Induced Gastric Inflammation: T Helper Cells and Matrix Metalloproteinases at a Crossroad" p114-151. In: G. Mozsik (ed); "Current Topics in Gastritis - 2012" (ISBN 978-953-51-0907-5) InTech publisher, Rijeka, Croatia. Nair, G.B., A.K. Mukhopadhyay, A. Safa, and Y. Takeda. 2008. Emerging hybrid variants of Vibrio cholerae O1, p179-190. In S. M. Faruque(ed), Vibrio cholerae: Genomics and Molecular biology. Horizon Scientific Press. Norwich, UK. Mukhopadhyay A.K., and G.B. Nair. 2011. The Rapid Diagnosis of Cholera: Where Do We Stand? p128-146. In D. Raghunath, V. Nagaraju (ed), Diagnostics in Infections. Macmillan Publishers India Ltd.